The final day of our DR trip was amazing! After a nice morning breakfast by the water and some good prayer and prep time, we visited two New Life school campuses, which serve kiddos ranging in age from 4 to 15. We performed mini-dramas sharing our brokenness and Jesus’ saving grace… and we played games too. It was such a gift seeing these awesome children respond to us. They were open to hugs, discussions about their hearts, and some soccer fun. The children were amazing! To see each team member using their spiritual gifts and sharing the Gospel was so encouraging too (I Peter 4:10). Praise the Lord! There were tears as we left each campus – but joy as well, because we know the strong Christian leaders the Lord is providing them within the village community. It’s clear by the intentionality and care seen that the Lord loves them so much and is with them (1 Samuel 2:8-9). We wrapped up our very special final evening with group time spent praising the Lord and challenging one another to be intentional with the Gospel in uncomfortable opportunities. We also focused on slowing down to build deeper relationships when we get home. Finally, we shared words of encouragement to one another. It was humbling to see and hear others share challenges that led to a deeper dependency on the Lord, and how Jesus was seen in each and every imperfect person within our group. It was such a testament to God’s faithfulness, the work he continues to do in our hearts, and the Holy Spirit’s powerful guidance (Hebrews 10:24-25). I’m so thankful for this family the Lord brought together for a truly unforgettable mission. Here we go! Next stop Dallas, Texas (Acts 1:8). On Day four of our trip to the Dominican Republic, I was so blessed to be able to step into the lives of five Residents and Fellows, eight fellow adult travelers, and seven kiddos as we work on mission with the Lord. The funny thing is, one of the messages I’ve heard and learned from this trip is that we will be served and grow more from this trip than we will be serving. We’ve also heard that our long-term mission is at our home, where we are living and serving others for the Lord. On Sunday, we went to a wonderful Creole Haitian church, filled with God’s people. I am reminded indeed that God is a Savior to all! He prefers no race, no color, no gender, and He is calling all people to Himself (Revelation 7:9). I loved the singing in Creole and fellowshipping with some of the people afterwards. We also had the opportunity to spend the afternoon with the missionary couple Jody & Perla, seeing the culture and rich heritage of the people of DR. We even learned about the original Tainese people who became extinct because of man’s greed for wealth. We learned through our training class that no matter how short or long it has been since we were saved, we still have brokenness. God, however, in his mercy, continually restores us to Himself through the cross of Jesus Christ! That is for all people! What a beautiful thing! Waking to the sound of birds singing and meeting for breakfast by the ocean, I relished in the fact that after meeting with Jody and Pearla, a missionary couple who have been here for 10 years, the same God is a work here in the DR. He is raising up pastors to shepherd the body here, just as Brad and Vanessa do so well at Mission of Hope in Haiti. One if the men they work with is a dear friend from youth ministry days in Nashville. What a joy to reconnect with Brad on this new mission field, where he and his wife Brooke have invested the last 15 years with “Until They Know,” fighting corrupt orphanages and being put in jail for defending the rights of orphans and women who are trafficked, while raising up leaders for the church. It is so good to see his faith still vibrant and growing. As we packed up for a day of adventure with this delightful team, the excitement was contagious! One of my favorite parts of our family trips is sitting by someone new on each bus ride. As we departed the hotel, I sat by Sheelu, my new friend who was raised in an orthodox Christian church. She told me how her faith had been so strong early in her life and even led her to seek out a “true believer” within her denomination to marry, which meant she waited much longer to marry than anyone else in her family and had to trust God’s perfect timing before He brought her husband to her in a most “unorthodox” way. We connected on how a house full of children can dull your spiritual disciplines and how Equipped Disciple brought them back to life. Now she is leading a group of ladies in her own home through Equipped Disciple 1. After we trained, we had lunch and headed to the villages. We met with Haitians whose families had come to work on sugar plantations -but when they were shut down, they were left with no jobs in a country that does not want them. After singing “Amazing Grace” in Creole and English and praying outside the small church in the center of the village, we went house-to-house, guided by our translators who work in this village. We sat with a blind man who lost his sight to diabetes, women washing their clothes by hand, an older couple shelling beans, a young girl who felt unaccepted by the Lord because she loves to dance… all ashamed to go to church because they were not “ready” to walk with Jesus. (This shame comes from the common belief by works-oriented churches who teach a false gospel…they believe they must have the right clothes or their life in order to come to fellowship.) It was a joy to share the hope that “there was a time when each of us were desperate, hopeless and broken but then made Jesus the King of our life and then became content, full of purpose and joy and whole.” Noah gave each of us a Bible in their language to leave with these new friends. We left sure that folks had heard the good news and would be followed up with by these pastors in their village. The next few bus rides were spent hearing Chris’s story of redemption through re:generation, from a life of performing and achieving to escape the pain of his abusive childhood and broken marriage. We were able to wash away the weariness of the day in the ocean and enjoy the sunset, while Austin unfolded the story of Mission of Hope in the DR. This was followed by a great dinner, relishing in stories of the joys and trials of raising “little women” along the path of faith back in Dallas. To close the day, John led us in more fun games we could use with the children we met, and we literally fell asleep listening to stories of how God had worked in and through us this day. Can’t wait for tomorrow! After breakfast by the ocean, our team took a bus to Pastor Thomás’s church in Puerto Plata to decorate in preparation for a pastoral graduation. While driving through this beautiful but impoverished country, our new friends Sheelu and Julia Matthews started the day off with the singing of the National Anthem beautifully. They were appointed to sing due to their tardiness getting to the bus… but soon the whole team then joined in. Arriving and getting to work, we were brought back to memories of elementary school days while using streamers, balloons, and all sorts of graduation decorations to decorate the small yet beautiful church led by Pastor Thomás, who graciously donated the space for this incredible event. After filling the church with bright color, we drove back to our temporary home for personal time and lunch, then dressed up in our Sunday best to join Pastor Noah Joyner and his wife Stephanie for a precious and sentimental event. 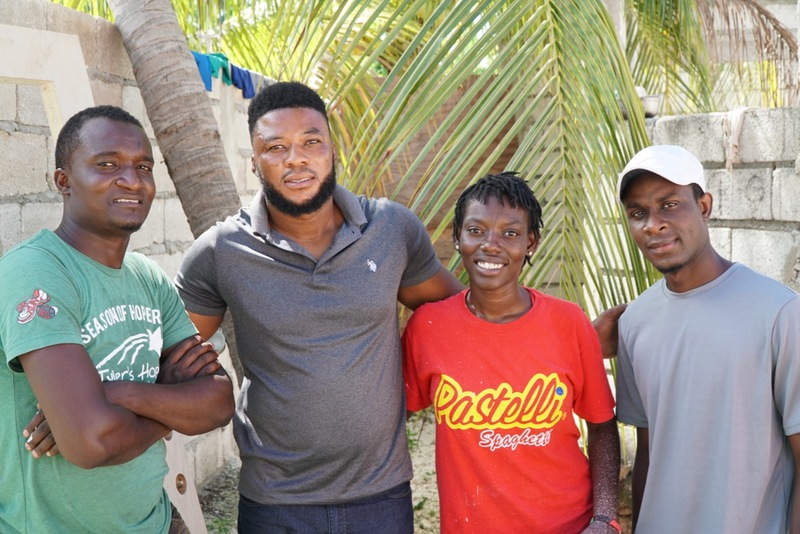 Noah, alongside Elmond and many others, began an amazing pastoral college in 2015 after seeing a need for equipping Haitian pastors who live in the Dominican Republic. That journey began with 30 men in the program, and after 4 long and hard years, today 9 men became the first graduating class ever from Noah’s seminary program. Eventually locals filled up every seat in the church to celebrate the graduation in a hot and steamy – but beautiful and tear-filled – three-and-a-half-hour ceremony. We celebrated these 9 pastors, who committed themselves to bring the truth of God’s work and the Gospel to their local communities. One of the nine to graduate was Lucemane, who was actually conferred his degree posthumously, because he passed away one week before the group’s final class. It was a sorrowful yet special time as his son received his father’s diploma and we all prayed over their family. This community is filled with such beautiful children and families, who yesterday came together to celebrate these strong, brave men, their willingness to serve, and all that God has done in their lives. Words of encouragement and prayer never ceased. We then headed back for team bonding and dinner. We sang and debriefed from the day, then Jonathan & Zoe Roberts taught a group devotional on Philippians 1:12-26 about advancing the gospel and being on earth for a purpose – to share the story of the Bible. Even though we are now getting comfortable here in the DR, we were challenged not to go home and revert to comfort. Instead, we should often be uncomfortable back home, as with boldness we will share what we have learned, our stories and testimonies, and the Gospel in our own backyard. The singing and dancing continued as we started learning how to two-step from seemingly professional teacher John Bundren. Kids, MOH leaders and interns, and Watermark Residents and Fellows showed off the impressive dance moves they had just learned. As part of our debrief, we reflected on the fact that not only have we been able to serve others and share the gospel, the Dominicans have truly served us as well and given us so much. We have learned multitudes in the past three days together. This learning has come from the local pastors and other residents – these brave strong people who show joy and perseverance throughout the hardest of circumstances. Have you ever had expectations for something – and God took it and did more with it than you ever could have dreamed? Trying to find the words to describe what God has done here – and specifically in the past two days – is incredibly difficult, but here it goes! As mentioned before, we are here to encourage community here in Haiti, and for a short time to do life with the people that God has placed in our path. Not only have we had the opportunity to have conversations with people in the surrounding villages, but the kids living in the Village of Hope here at Mission of Hope are also learning to form their own community groups! Last night with them was so sweet: The girls and guys broke up into groups just to share what was going on in life and what God has done in all of our lives. The girls broke up into one-on-one conversations – and in debriefing with others, man did God move!! These girls opened up and shared things and allowed us to pray through things with them. To be honest, it is going to be hard to leave after forming these bonds. This morning our sub-team split up, and some of us went into the village to finish a conversation with a woman we spoke with yesterday. She is Catholic but very open to the grace of God, which several of our team had the joy to talk about with her. 6 girls on the whole team stayed back and did life with the “mommies” of the Village of Hope kids, and we just got to brainstorm how to open the girls up more. (Teenagers, am I right??) Being a teacher myself allowed us to all relate with each other, as we see different things from kids day-in and day-out. After that, we got to do laundry and cook with them, and it was such a sweet morning. In the afternoon, we participated in our last Kids Club of the week, sharing the gospel with the children through jelly bean candies! God is so good, and we have also been encouraged by the number of fellow believers we’ve met along the way. I can’t believe our week here is almost over, and I am beyond thankful for what He has revealed to us here, in and through the people of Haiti! We’re in the full swing of things here in Haiti – and wow, the Lord is using us in a way that’s truly indescribable. It’s Wednesday, and we have been to Titanyen two days in a row. We’re currently en route to Canaan for an afternoon with some precious kiddos! Serving the people of Haiti has been nothing short of amazing; it’s only Wednesday, and the stories that our whole team could tell deserves a website of its own. From meeting with a voodoo priest, to praying over the sick, to encouraging young adults that have chosen Christianity over their parents devoted voodoo practices, to helping those in the villages with pumping water and cooking… this is purely the Lord working through us young adults. Our main focus this trip was to instill the importance of community in the people we’re serving. With that, having small, intimate gatherings with the young adult orphans of Mission of Hope was imperative for us. We broke into teams and truly built trust, enabling them to share some things they may have never shared before. We talked about our own struggles and how we’re not that much different from each other even though thousands of miles normally separate us. We all struggle with different things, but one thing that we have in common is that we have a God who is absolutely wild about us. We have made a tremendous amount of progress and this is just the start! We’re even using resources from Watermark that have been translated into Kreyole so that the “mommies” of the orphans are better equipped to lead these kids. HOW AMAZING IS THIS? In our downtime, we’ve been playing some pretty intense games of Farkle that have resulted in some pretty embarrassing dares. A few people have lost some of their personal items – and to earn the items back, some pretty amazing interpretative dances have been performed during our breakfast time! The encouragements, laughs, memories, and fellowship have truly been amazing. All of this is possible because of our love for the Lord. We’re all doing amazingly well and can’t wait to see what else God will do in the coming days. Until next time, LET’S GO CHURCH! We leave the airport and pile into the 1995 rusted school bus. Everything and everyone made it – except that one exploded jar of tomato sauce… and everything in the tomato sauce’s suitcase. The dusty road enters your heart as the bus passes concrete houses and traveling villagers. You make eye contact with a boy no older than 14, possibly on his commute home from school. Does he know Jesus? Does he know he is loved? The rickety bus travels deep into the country, bringing with it the chance to share our hope and our hands with the beautiful people of Haiti. You pull up to Mission of Hope after dark. Through the light of the headlights, you watch the rusty gate open and 12 interns in red polos run up to greet you with smiles. It’s past 7pm and you’ve been awake since sometime before sunlight – like WAY before sunlight – and their hospitality warms you. Out of the bus you roll. Into your beds you fall. 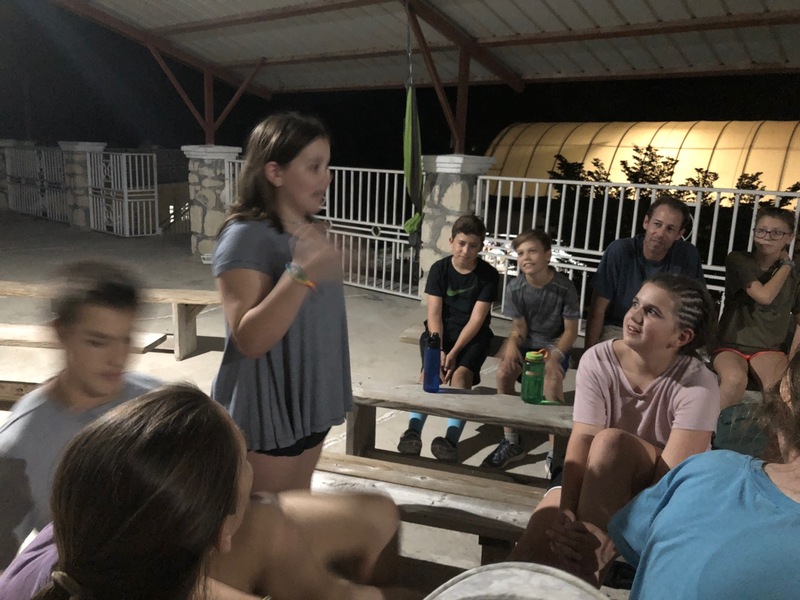 6am roosters start calling WAY too soon… wake, devo, breakfast, tour, church, introductions and games with the kids at the Mission of Hope campus, dinner, games, pray for Team 3 (who must dance at breakfast as a result of losing a Farkle game). Overall, the Watermark Team is in great spirits. Tomorrow we begin ministry with the orphans and go into a village. Pray His name would be known. Pray the people come to understand that they are known. In Dallas, Sundays can be a brief distraction to the busyness of life. But rarely, at least for me, is Sunday a “Sabbath” experience. Here in Haiti, removed from the trappings of my life in North Texas, I was reminded of what it could be. We rested… and not just resting in the absence of work projects or sporting events or social media, but resting in God’s goodness and mercy. The day started with corporate praise to our God who is able to save both Americans and Haitians. 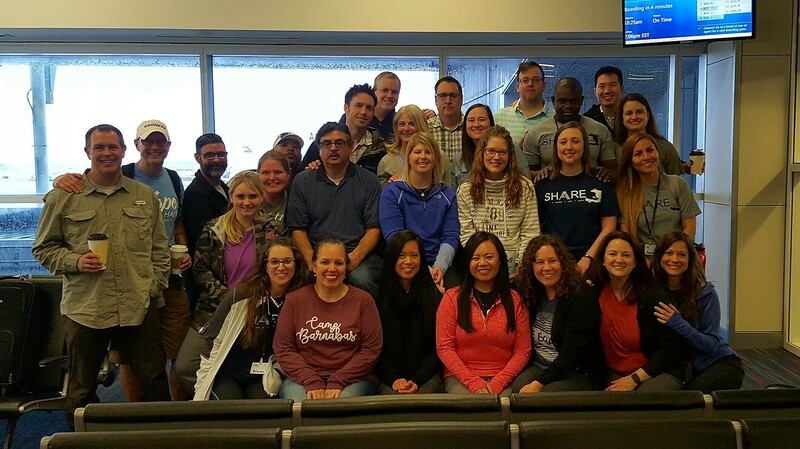 Our team then decided to spend time together sharing our stories of life transformation. That time has been my favorite so far. I was encouraged by hearing about the power of God to forgive sinners, restore families and relationships, and provide an eternal hope for today and for the world to come. Lunch was followed by a time of intentionally engaging with other families and teams here at Mission of Hope, as well as with staff and orphans. Our team played basketball, made jewelry and other crafts, and sought to initiate conversations with our “neighbors.” Evening was spent reflecting on all that God has taught us and done through us, and being challenged to be “Village Champions” where God has placed each of us in Dallas. The day ended with fun games of Uno, Farkle, and Mafia. Rest! Not simply the absence of activities, but the intentional pursuit of loving God and loving others. Jesus calls to us who are weary and heavy laden, and He promises rest. His promises are true. As I write this, we are wrapping up our third full day in Haiti right now and reflecting on the time that we have had, as the Lord continues to reveal more and more of himself to our team through the Haitians and their lives. Our first day, we spent our time in a village called Labordri. Our team spent the day planting trees for the people in the village, and we spent time getting to know the men, women, and children that lived there. For the second half of the day, our team was split into two groups, and we led kids’ clubs at two different churches in the village. This time was spent loving on the sweet kiddos that we often see running throughout their homeland. Ridge, one of the four Thomas kids serving on our trip, developed a really cool relationship with a fifteen-year-old Haitian named Berlonto. I was blown away by the way that Ridge loved on this kid, who was three years older than him. He didn’t do or say anything extraordinary, but he made an impact on this fifteen-year-old by just being a friend who would hang with him, ask him about his life, and play the beloved game of fútbol with him. It is so cool to watch even the younger kids be the hands and feet of Christ by using their gifts and being faithful where the Lord places them. One of the biggest encouragements from being in the village came from the actions of our village translators and our village champion. Two men in particular, Nixon and Geff, led our group boldly and intentionally, and in such a way that furthered the advancement of the gospel. Towards the beginning of our time in the village, you could tell that everyone felt a little awkward, or nervous about what these conversations were supposed to look like. The desire to clearly communicate the gospel despite the language barrier was in itself enough to create angst and discomfort. Despite this, Nixon and Geff continued to spur us on to be bold and to take advantage of the opportunity to encourage their people. After briefly talking to a woman named Wilda, Nixon asked us, “What else do you guys have to say to encourage her?” Nixon went on to talk about how he loves that he gets to take us into his village, because he knows how badly his people need to be encouraged to continue to trust the Lord each and every day. He challenged us to dig deep in conversation with the people and to speak encouraging truth to them, because that is what we are there to do. I was blown away by these two men and their boldness and commitment to the message of the gospel. They were walking through their own village, a place where they have lived their entire lives and had relationships with every villager, yet they continued to throw away everything to follow Jesus. This would be equivalent to me walking around my high school, JJ Pearce, interpreting the gospel to each and every person I knew. This is ultimately what Jesus asks of us and reflects his calling to “drop our nets and follow Him” as talked about in Mark, chapter one. Unfortunately, tomorrow is our last day in Haiti, and we will be wrapping up our time here while spending the day at the beach to relax, spend time as a team, and reflect on the past few days. Continue to be praying that we would be bold in our conversations with each person we meet and that we would continue to live on-mission even as we come back home to Dallas. All in all, our prayers for ourselves and for every follower of Christ are that we would live each day in light of the radical nature of the gospel – because it is a message that is, indeed, radical. Today was our first field day in Haiti, and we experienced first-hand the truth that people really don’t care what you know until they know you care. We were the first group from Mission of Hope to go into the village of Robert in Archaie to do “ministry reconnaissance.” We went to gather the general sentiment of the people – such as where they are spiritually, how much access their kids have to education, if they have access to health care, etc. Mission of Hope’s vision is to bring life transformation to every man, woman, and child in Haiti under the leadership of Jesus Christ. And so, the gospel is to be present in all steps of the process. As my team approached the first house, the translators told us the homeowner didn’t want to accept Christ today. We quickly found out that a part of our team had started off by asking her if she knew Christ and if she wanted to accept Him today. Since her answer had been No, our translators told us we should move onto the next house. But we told them we wanted to continue speaking with her to get to know her. Throughout the next hour, we were able to articulate the gospel and two personal stories, but for much of the time, the lady of the house had her arms crossed. We were not able to make much headway with her, but were able to pray for her infirm lower leg. Our afternoon activities proved to be more successful in terms of connecting with the villagers. We were able to use a more indirect method. We first built up a rapport with them before diving into their spiritual health. Though our intention both that morning and in the afternoon was to love well, our strategy change for the afternoon proved to be more successful in building a relationship with people. We worked to find a common bond rather than try to get a salvation conversion right away. The Gospel can be something boldly declared, but when we can, we want to get to know the person, develop a relationship, see if there are connections, and continue to invest in the person. That’s what Paul did when he revisited his converts. It is a privilege to be a small part of Mission of Hope where we can be one of the many touches, knowing this local sending station and future teams will be back. The Gospel is not a short-term investment. God’s mission is not a short-term work but a long-term investment. This is not the end of the story for these families. Pray with us that the people we visited today will soon be fellow worshipers our great Lord and Savior. To get a message when we post an update, enter your address & hit Subscribe! Watermark in Haiti Copyright © 2019.